We're interested in talking to owners of 2003-2007 Saturn Ions who have had their ignition replaced or have experienced the engine shutoff problems. 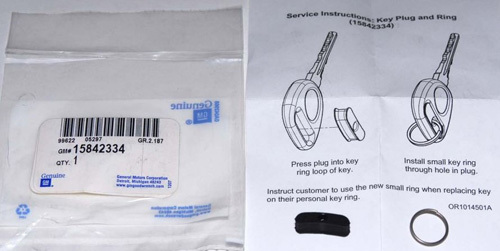 In addition, according the NBC News, there were also about 500 people in the country who were given one of the plastic plugs (shown above) a few years ago to put into their key ring from GM. Did anyone get one of these? If any of these pertain, please send me an email or post your experience as a comment below. Thanks! After getting the chance to get behind the wheel to test drive a prototype version of the upcoming 2007 Saturn Vue Green Line, BusinessWeek magazine gave the vehicle a very positive review. There are currently 7 users and 414 guests online.